Lifelong protection against tooth cavitiesresults from continuous use of low-concentration fluoride. When communal-water supplies are available, water fluoridation clearly represents the most effective, efficient, and economical of all known measures for the prevention of tooth decay. Unfortunately, fluoride in water is available to only about two-thirds of the population. Thus it is obvious that additional measures by the dental profession are needed to provide greater protection against cavities. The term topical fluoride therapy refers to the use of systems containing relatively large concentrations of fluoride that are applied locally, or topically, to erupted tooth surfaces to prevent the formation of tooth cavities. This term encompasses the use of fluoride rinses, dentifrices, pastes, gels, and solutions that are applied in various manners. Among dental practitioners, however, this term is generally considered to refer to professional topical fluoride treatments performed in the dental office. Fluoridated varnishes are effective in both adults and children. The slow release of fluoride from the resin vehicle results in lower peak plasma fluoride levels than from swallowed fluoridated gels. Duraphat (Colgate Oral Care) is an alcoholic solution of natural varnishes containing 50mg sodium fluoride per mL (equivalent to 22.6mg fluoride per mL). This fluoride varnish resin remains on the teeth for up to 12 to 48 hours after application, slowly releasing fluoride from the wax-like film. Concentrated fluoridated gels are marketed as cavities-preventing gels and treatment gels. Variable dosage during application, followed by accidental swallowing, can result in ingestion of large amounts of fluoride, which may contribute to mild fluorosis of mineralizing permanent teeth. Highly concentrated fluoridated gels (for example 9000 to 12,300ppm fluoride) are limited to professional use in dental offices and not dispensed for home use. Lower concentration gels (for example 1000ppm fluoride) can be used at home following careful professional instruction and demonstration of proper product use. Acidulated phosphate fluoride (APF) gels contain 12,300ppm (parts per million) fluoride and are used for professional applications. It consists of a mixture of sodium fluoride, hydrofluoric acid and orthophosphoric acid. APF gels are used primarily for the prevention of development of cavities and are swabbed onto the tooth surface or applied in closely fitting trays. A neutral pH gel with 9000ppm fluoride can be used for cases of enamel erosion, exposed dentine, decayed dentine or where very porous tooth enamel surfaces exist. Sodium fluoride is chemically very stable, has an acceptable taste and is non-irritating to the gums. 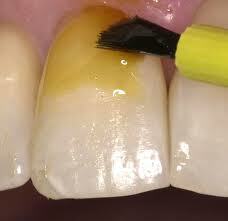 It does not discolor teeth or fillings, in contrast to APF or stannous fluoride, which may cause discoloration. A stannous fluoride treatment gel can be used for remineralization of initial cavities and teeth with developmental defect that causes less enamel formation. The 1000ppm fluoride gel has proved effective in arresting decay on the root surface of teeth and has been incorporated into a synthetic saliva solution to reduce cavities in cancer patients who had undergo radiation therapy. A very small amount is placed on a cotton bud and applied to dried tooth surface by adult or for a child by the parent at home. In applying to children’s teeth, the parent must be fully compliant in following professional instructions. 10% stannous fluoride solution may be used to target local ‘at-risk’ surfaces of teeth such as deep grooves on the tooth surface or initial cavitations in areas between teeth. The stannous ion may cause discoloration of teeth and staining on margins of fillings. CPP-ACP (Tooth Mousse, GC Corp) are available as crèmes for topical application at home. Applied to tooth surfaces at risk for decay or erosion or with initial cavitations, CPP-ACP releases fluoride, calcium and phosphate ions for local remineralization of tooth enamel. Tooth Mousse Plus contains 900ppm fluoride and this fluoridated product is for use by individuals over age 6 years. It is applied to teeth after brushing and flossing by smearing across tooth surfaces with a clean finger or cotton-tipped applicator. The crème is not rinsed out and should not be used by individuals with a milk protein allergy. This entry was posted in Oral Care and tagged cavities, colgate, fluoride, fluoride dental treatments, fluoride in water, fluoride varnish, sodium fluoride, tooth decay, topical fluoride on September 11, 2011 by oileng.